Trying to work out this issue while I'm stuck at work. 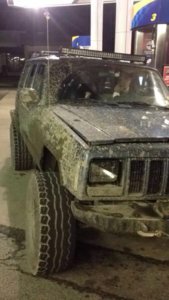 Last weekend my '99 Cherokee XJ 4.0L - started to run hot - "check gauges" dash light came on. I immediately pulled over, and I noticed that there was no coolant in the reservoir. Filled it up and went on my way without issue. This is odd because I checked, and added some the week before. I usually check my fluids on a regular basis. Today the "check gauges" light came on again because it was running hot again. Pulled over again ready to fill up the reservoir, but this time it was full!??? Drove part of the way to work (just a few minutes) with the heat blasting to keep the engine temp down, but then the rest of the way to work I turned off the heat and everything seemed fine. Even while sitting at lights a couple times for over a minute or more, the temp gauge didn't climb. My first assumption is that the thermostat is not working, or only working when it wants to. The fan seemed to be working over time this morning too. Could this be a water pump issue? Any insights so I can pick up what I need this afternoon? I know the parts are not very expensive, but I can't replacing both this week. It was the fan clutch. But I also replaced the thermostat at the same time. BUT a few weeks later, the water pump went out as well, so that got replaced too. The shocker hand pose in the picture tells all i need to know. Ron, Chris_Keziah, ckruzer and 1 other person like this. Doubt it. This is the same guy who brought back a 7 year old thread just to brag about his "straight piped" I6 and how it wasn't that loud. I ran mine with Straight piped to the rear axle for a while because I liked the sound but it was just too loud. Got a headache every time I drove it. So now its got a thrush glasspacked on it and sounds good without killing everyone's ears. Coolant just doesn't magically disappear, has to go somewhere. Either you have a leak or the hg is leaking. More than likely your water pump and tstat are working fine and it's just overheating due to lack of coolant. Keep reading, the answer is below that post. He's had a few years to get it sorted out. I forget that some vehicles still have a mechanical fan, that seems like something from the dark ages. But hey, that's where all Jeep products come from. Yeah totally didn't check the dates on that. Edit: Actually tapatalk did done weird sit and put the posts in a weird order and I thought it was recent. Still should have looked at the date though.